The most obvious factor on how to differ DDR3 from DDR2 memory is appearance. But, that is not as simple as it might seem. Unless you can find the specific reference on the memory stick, you will need to look at the key notch. Along the bottom of the memory stick, 240 pins insert into the motherboard. Among the pins is a notch. That notch prevents inserting the wrong type of memory into an incompatible slot. Looking from the top side, the notch on the DDR2 lies slightly to the right of the middle point of the memory stick. On the DDR3, the notch is slightly to the left of the middle. DDR2 memory sticks do not fit into the slots for DDR3 sticks or vice versa. One reason why many manufacturers have been slow to adopt the newer DDR3 technology is because there is no backwards compatibility between the two. You cannot use a DDR3 when you do not have an appropriate slot in the motherboard for it. Some newer motherboards come with the ability for both types of memory to work. However, it is important to know how to differ DDR3 from DDR2 memory before you purchase it. What else makes these memory sticks different? Transfer speed on DDR3 is double that of the DDR2. Transfer rates on DDR2 range from 400 to 800 Mbps. On the DDR3, the range is 800 to 1600 Mbps. The DDR2 has four internal banks of memory while the DDR3 has eight. The DDR2 does 4-bit prefetch and the DDR3 does 8-bit prefetch. The DDR2 uses more voltage than the DDR3 does. The DDR2 runs with 1.8V while DDR3 runs with 1.5V. DDR3 memory has a slightly higher latency than the DDR2. There are other technical differences between the two as well. Currently, there is another significant way on how to differ DDR3 from DDR2 memory. The price is higher for the DDR3 memory sticks. Prices have continued to drop ever since the DDR3 came on the market a few years ago. However, the DDR2 sticks are still lower in price. But, newer motherboards are pushing the prices down on DDR3. The demand for the newer technology is starting to grow as higher memory requirements come into play with faster motherboards and chipsets. 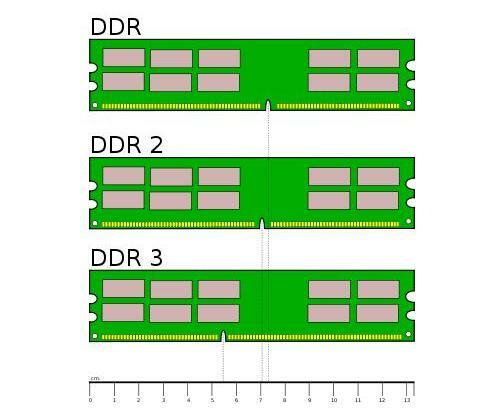 However, with the newer DDR4 technology planned for a 2012 release, the future of the DDR3 is still in question. nice answer but i was searching for slots… any way i got the answer… thank you!! Thank you for putting up useful information. I checked and my motherboard does not support DDR2. DDR Memory Upgrade – Do You Need an Upgrade or Not? Laptop Memory Upgrades – Does Yours Need One? Can Laptop Memory Be Used in Desktop and the Other Way Around?